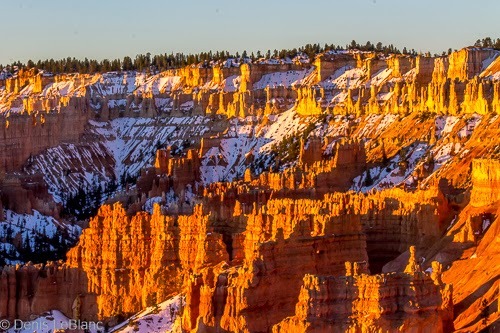 Bryce Canyon--"A hell of a place to lose a cow"
This is how Ebenezer Bryce, Mormon homesteader near the canyon that now bears his name, described it. I'm not sure if I could top that for understatement. 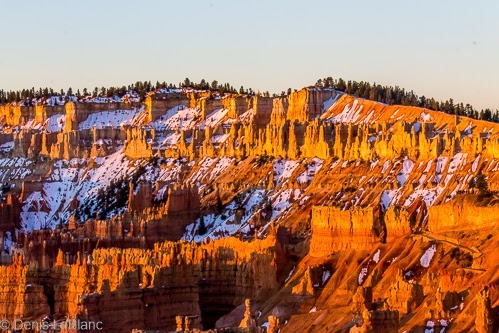 I think it can safely be said that there is no place in the world like Bryce Canyon. 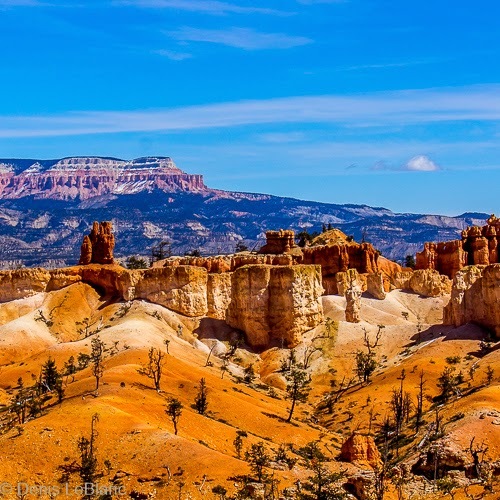 It is the top step of the "Grand Staircase" in the Colorado Plateau and part of the formation called the pink cliffs (there are also vermillion cliffs, white cliffs, etc. 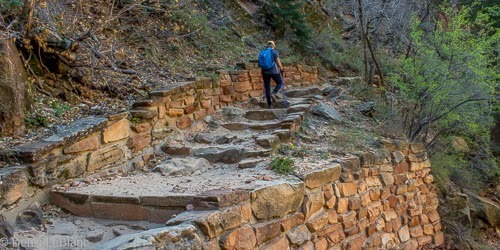 which make up other steps on the staircase). 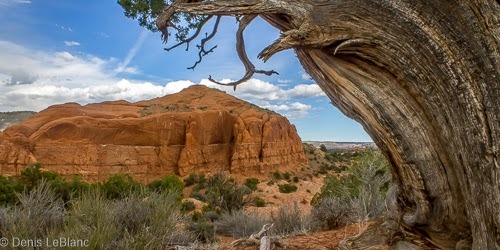 I can't really describe it, but recommend to anyone going to Utah that this park should really not be missed. 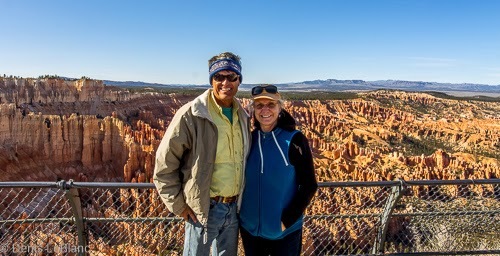 We went two days, once to hike down into the canyon and explore all the overlooks, and another day to catch the sunrise. I can't say enough about the beauty and strangeness of this place. 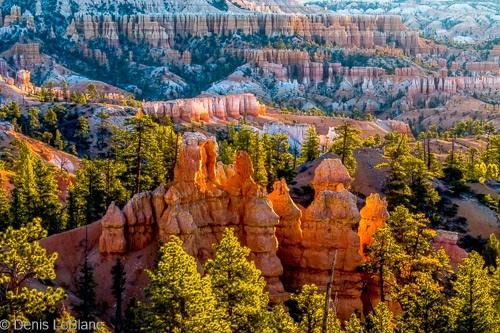 The colors and shapes of the rocks inspire the imagination. 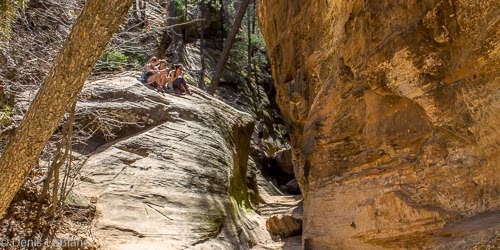 This canyon extends for miles and there are several hikes that explore different parts of the amphitheater. 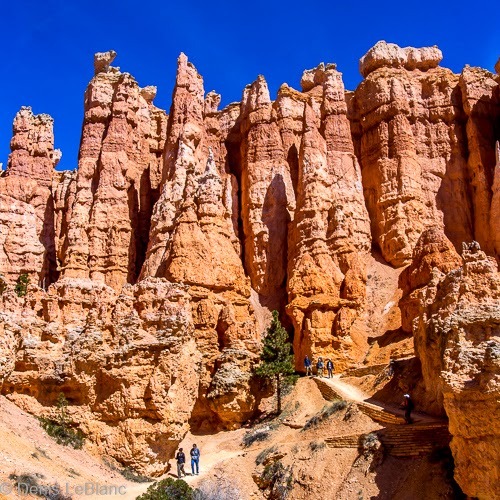 We took the Navajo Loop and Queen's Garden trails for about a three-hour hike. 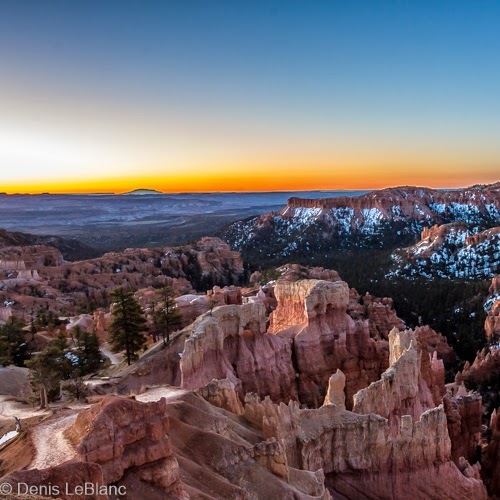 Two days later we got up at 6 AM and drove the 45-minutes to Bryce to catch the sunrise. 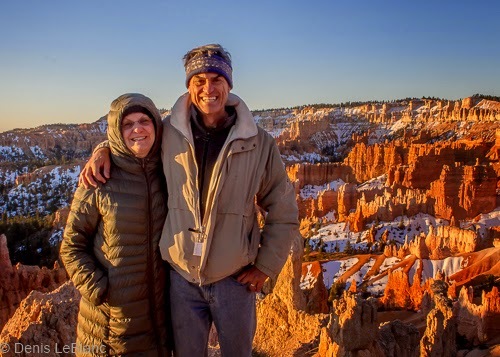 We went to appropriately-named Sunrise Point and, along with about 30 other hardy souls braving the 25-degree weather, waited for the sun to show up. 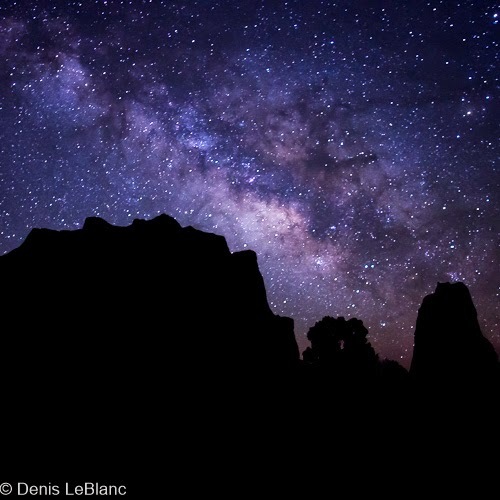 it was a truly awe-inspiring sight! 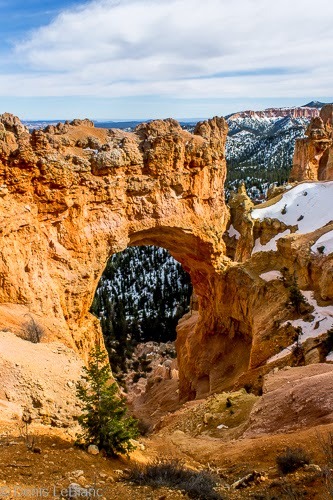 After visiting Zion (see lots more pictures of Zion here), we headed east and north towards the next major national park in Utah, Bryce Canyon. 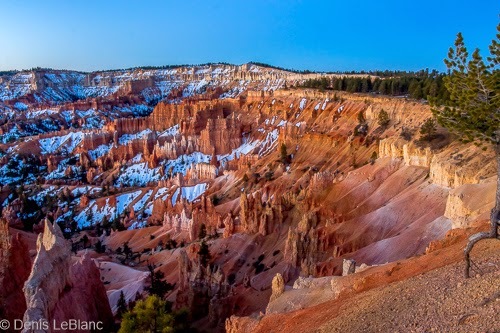 We had decided not to camp in Bryce for several reasons--sites were not reservable, it would likely be really cold up there (above 8,000 feet) and there were no hookups in the Bryce campground. 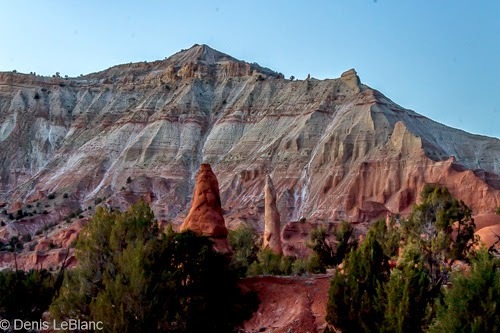 Nearby was a nice Utah state park called Kodachrome Basin that had a well-reviewed little campground with electric, water and sewer hookups and we had decided to stay there as a base for visiting Bryce and surrounding sights. 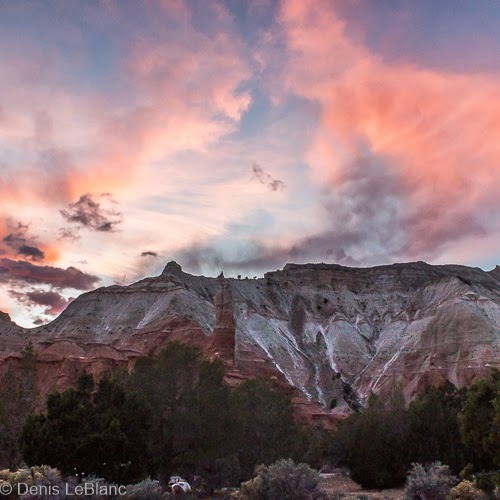 We couldn't have made a better decision, as Kodachrome Basin turned out to be beautiful, quiet and well-located for lots of exploring. 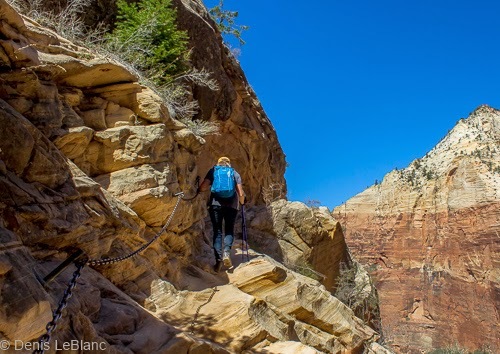 There are two famous iconic and challenging hikes in Zion, each challenging for different reasons. 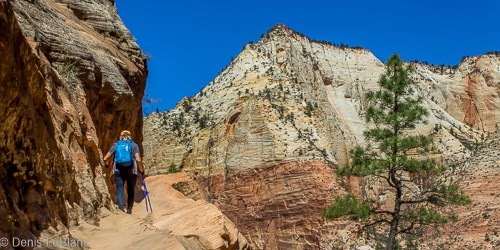 We were not able to do the Narrows, which involves hiking up a gorgeous slot canyon IN the Virgin River. 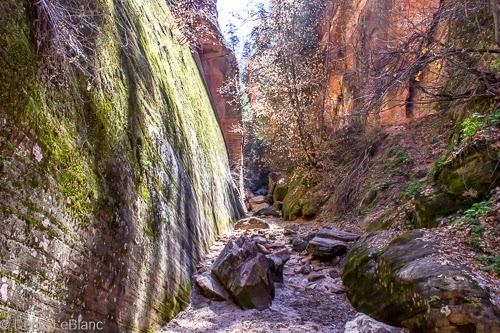 Sometimes requiring wading in 40-degree water up to your waist, this hike is so popular that many outfits in town rent waders and river boots to people who want to hike the Narrows. 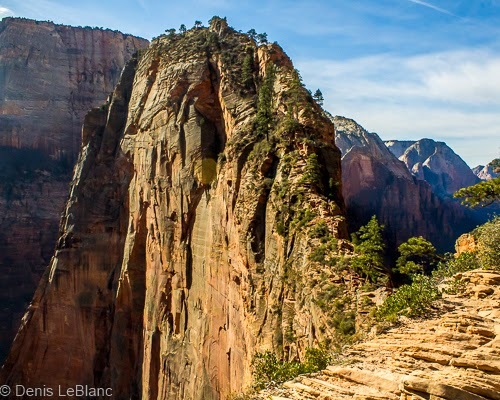 Lynnae hurt her back so she couldn't hike, but I decided I couldn't leave Zion without checking out the other most famous hike--Angel's Landing. 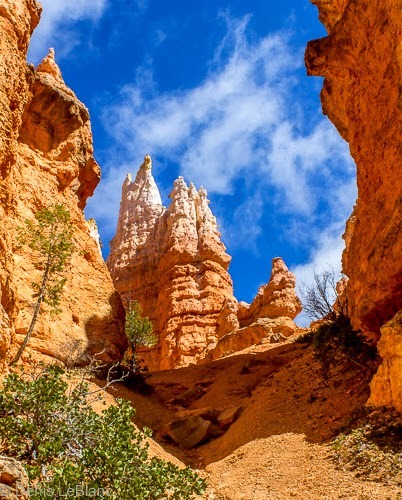 This rock rises nearly 1,500 feet above the floor of the canyon and was so named because it was thought that only an angel could land on the top. 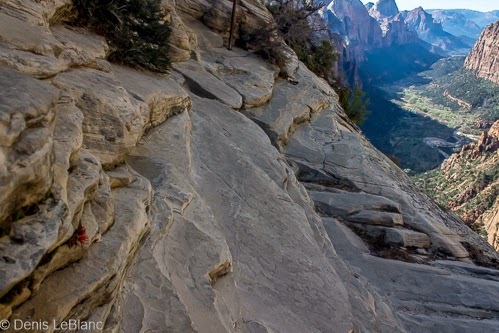 In the 20s, a trail was constructed to the top that included many switchbacks and, for the final ascent, a series of chains bolted to the rock, similar to the Hidden Canyon trail. 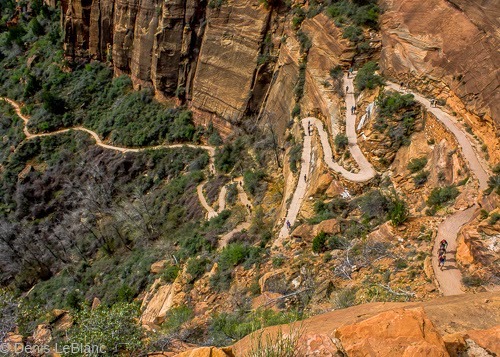 That trail is the minor leagues, but Angel's Landing is playing in the majors. The heights and drop-offs are vertigo-inducing. I saw many people turn around and head back down. It is definitely not for people afraid of heights. 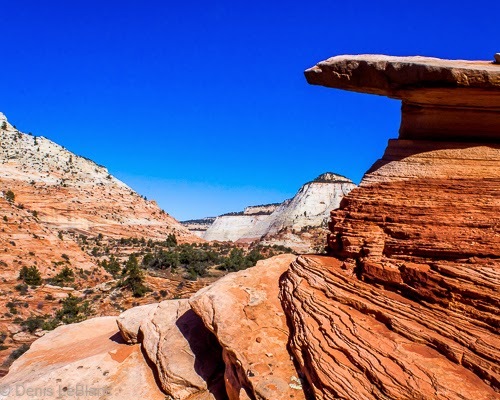 In some places the trail consists of slanted sandstone about three feet wide with a 1,000-foot drop off on the left and an 800-foot drop-off on the right. In other places you literally have to pull yourself up the rock with the chain with negligible footholds. 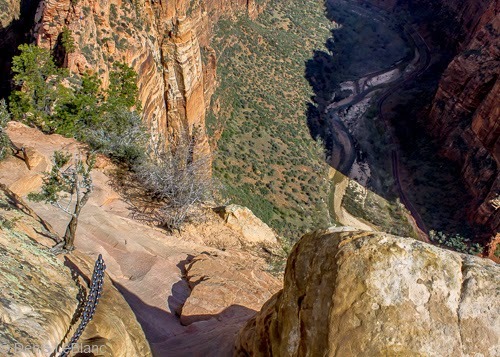 There are several flat spots to catch your breath and sometimes the biggest challenge is the steady line of people coming the opposite direction competing for access to the chain! Eventually the top is reached and the views are really spectacular and worth the effort. There is definitely a wonderful feeling when you meet your fear head on and break through it to the top! 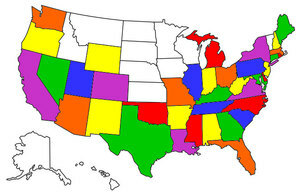 The chains are really welcome! 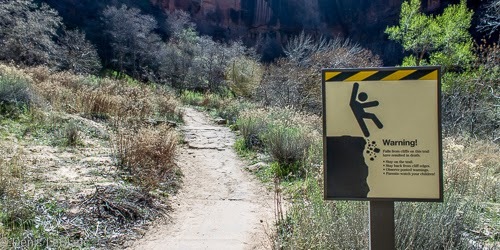 For some reason, there is no chain on this section--don't slip! 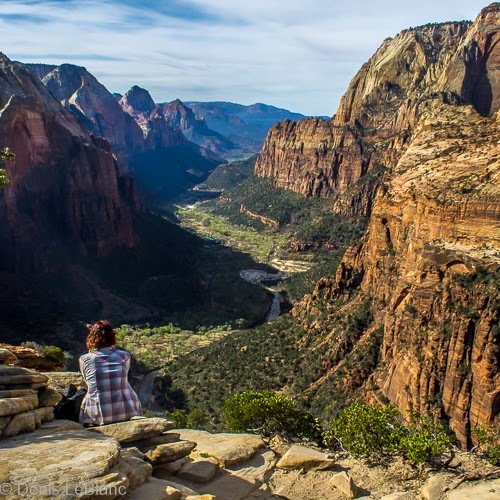 Like Yosemite, Zion National Park is most famous for its main valley/canyon and many people don't venture much outside of that area. 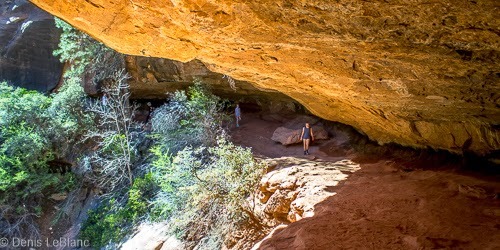 In the case of Zion, it is just a short drive through a historic tunnel to reach the eastern plateau, which has very different scenery than the main canyon. 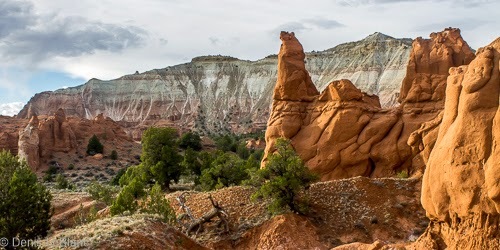 We took that drive and planned to combine visiting the eastern plateau with a longer jaunt outside the park to a unique Utah state park. 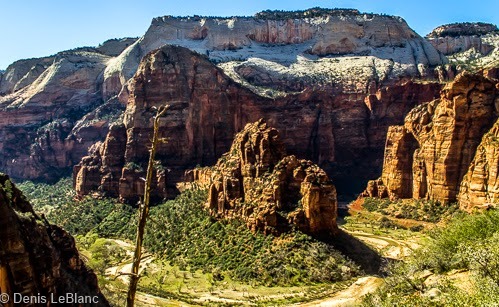 Just a few miles up the main canyon, the main park road goes through the Zion-Mt. Carmel tunnel, built in the 20s. 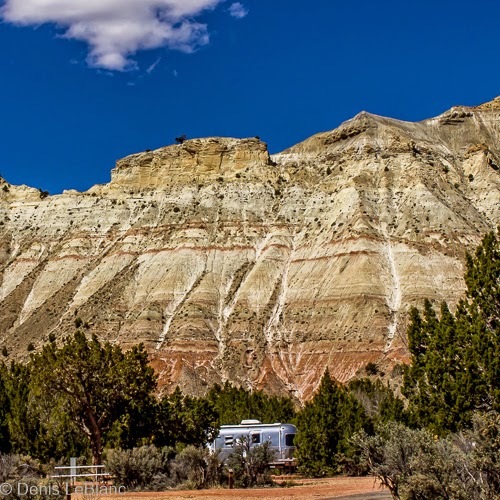 It is too small and short for today's trucks and RVs, so to drive through it with a trailer like ours requires a special permit so the rangers can close the tunnel and the RV can drive right up the middle of the road alone. We were going to have to do this in a few days, so it was good to get a preview of this tunnel. 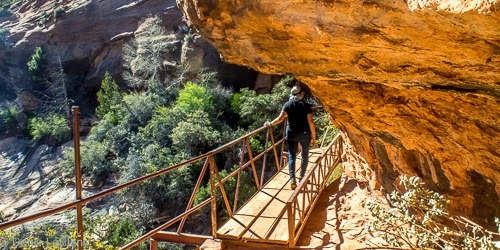 Just on the other side of the tunnel was a trail one of the three high lookouts in Zion. 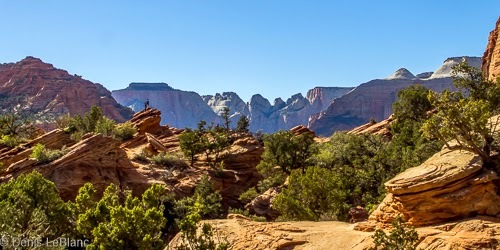 This one, the Canyon View trail is by far the easiest of the three and gave spectacular views of the upper canyon. 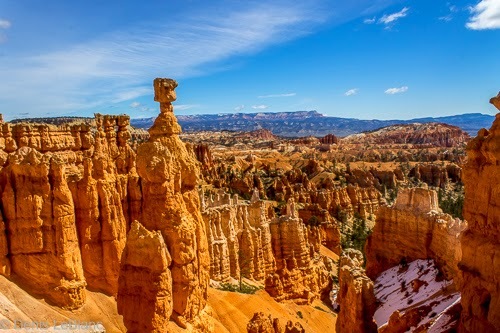 The road from the tunnel to the east entrance of the park is only about six miles long, but it passes over the most amazing plateau of hoodoos (eroded rocks). 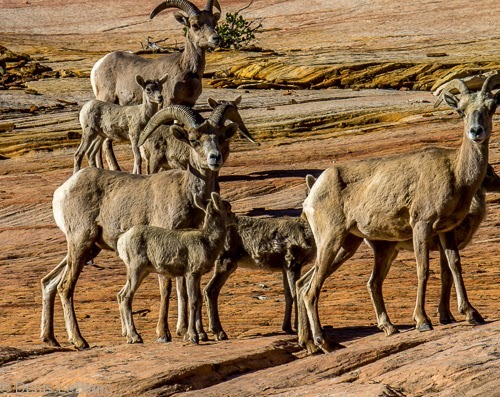 We also saw quite a few big-horn sheep who seemed very unconcerned about people watching them! 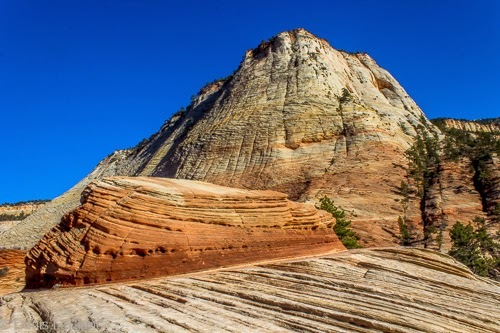 Another 25 miles past the east entrance to Zion is the largest sand dune area on the Colorado Plateau (which encompasses about one quarter of four states--Colorado, New Mexico, Arizona and Utah. 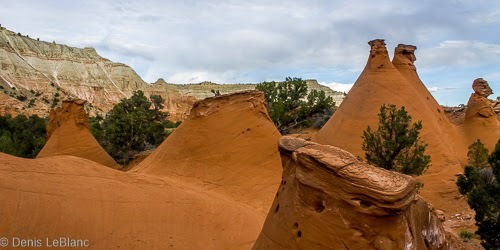 These dunes are made of very fine sand eroded from the pink, white and red rocks of the Navajo Formation and so have a wonderful pinkish-orange color. 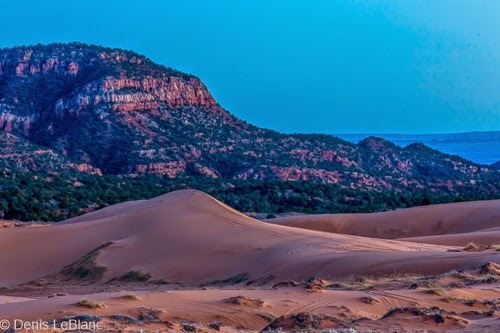 Unfortunately, their beauty is marred by the off-road vehicles that the state of Utah allows to ride all over the dunes. 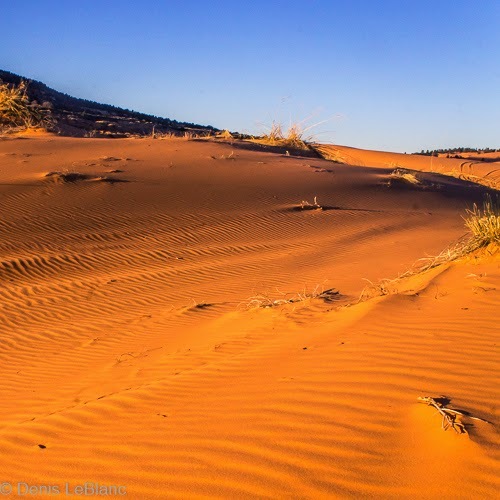 We were really disappointed to find that a week of spring break had tracked up the dunes to the point that it was hard to find any untouched area. Anyway, it was still pretty interesting, but not the photo opportunity I had hoped for. 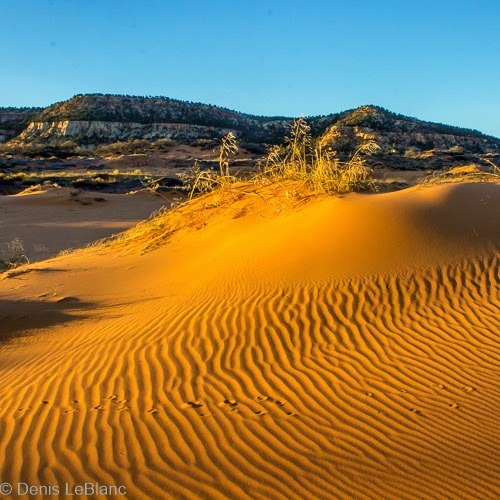 I did get a few shots that gave a sense of what these dunes are like. To give you an idea of size, there are people on top of the highest dune! 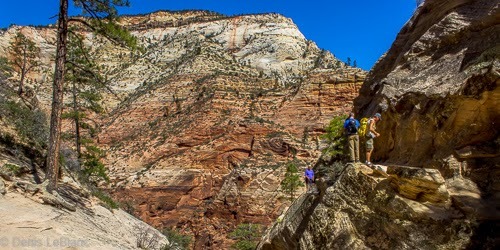 There are many great hikes in Zion, most of them requiring a LOT of climbing. 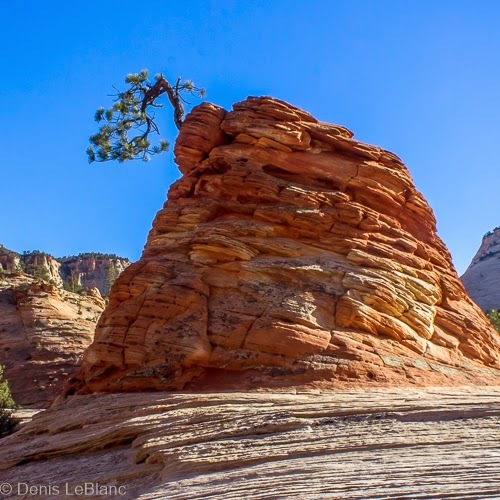 We picked a moderate hike that promised to be beautiful, somewhat challenging and a bit of a test of fortitude to see if Angel's Landing would be next. 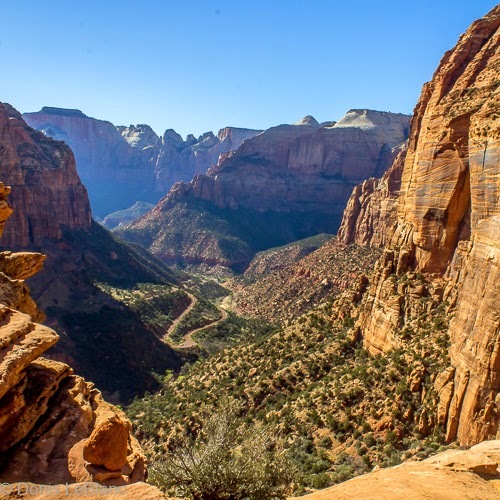 During the busy season (March to October), the main scenic road in Zion is closed to cars and visitors use the shuttle buses to get around. 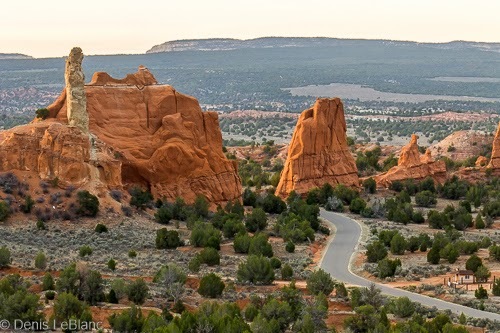 This works great, as parking is limited at the trailheads and the buses come every few minutes. Our campground was just a short walk to the first shuttle stop and we rode them a lot. 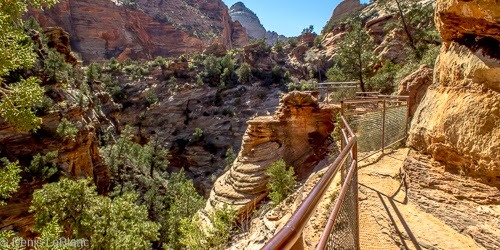 For the Hidden Canyon hike we took the shuttle to the Weeping Rock trailhead and headed up a broad, paved trail that consisted of long switchbacks carrying us up the canyon for bigger and bigger views. 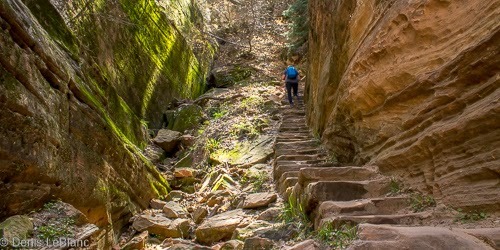 After a while, the trail branched off and became shorter, steeper switchbacks and finally a long stone stairway. At this point, things became interesting! 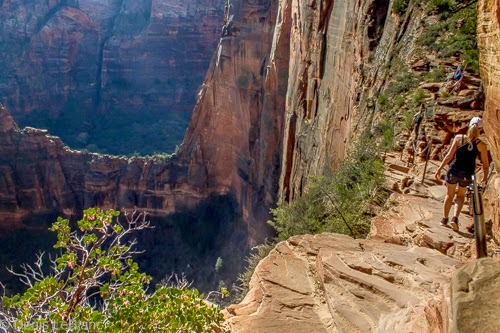 The trail winds around a couple shoulders of the mountain and at many points is narrow, steep and cut right into the side of a very steep cliff. 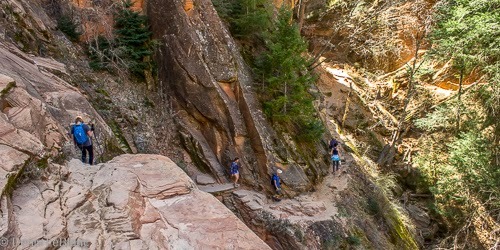 Here, the park conveniently places long chains so hikers can hang on for dear life while they navigate parts of this trail. 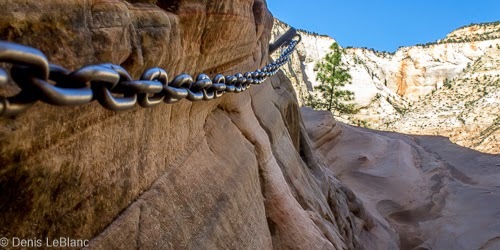 This is a preview of the much more difficult Angel's Landing trail that also uses chains. 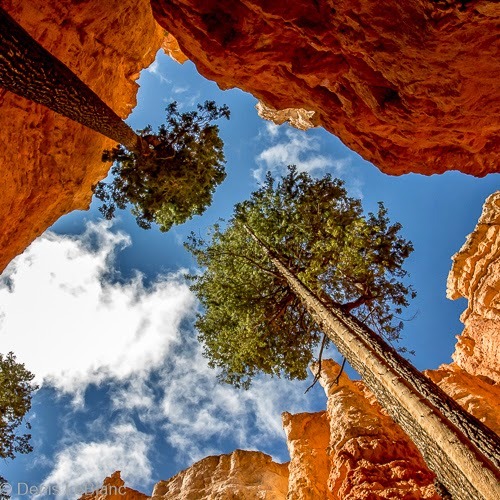 Well, we navigated the chains just fine and made it to Hidden Canyon, which is a hanging slot canyon cut into the White Throne megalith. 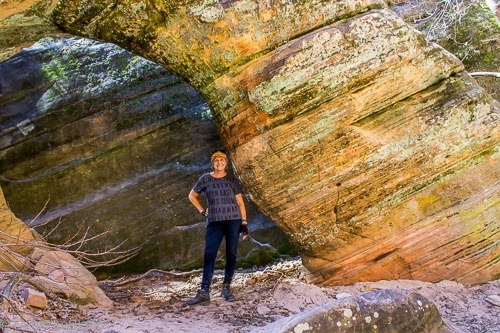 We explored this nice little canyon, found a small arch near the end and had a great lunch. 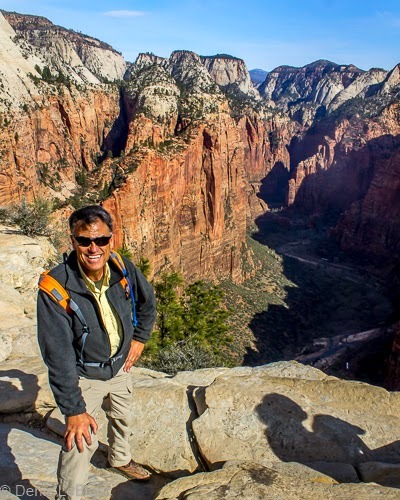 All in all, this was a wonderful hike to show off the beautiful and interesting landscape of Zion. A little warning to get your sprits up! Yes, we were glad the chains were there!